BULLet Points: Bulls handle Bucks, but is it too late? The Bulls held on for a 102-98 victory over the Bucks on Sunday, but they still sit two games back of a playoff spot with only a handful to go. Their odds are long, but nothing is off the table yet. The Bulls just have to keep pushing and hope things fall their way. Let’s take a look at their win in Milwaukee. Jimmy Butler followed up Saturday night’s massive triple double with another great performance. He notched 25 points, eight assists and five boards on 10/11 shooting, the first time a Bull had shot that well on 10+ shots since Scottie Pippen in 1990-91. Mentally, Jimmy looks to be all the way back from his knee issue after having some confidence issues in prior games. While Butler was masterful against Detroit on Saturday, he dominated the ball; at one point late in the game, several possessions in a row were the same Butler-Pau Gasol two man game. 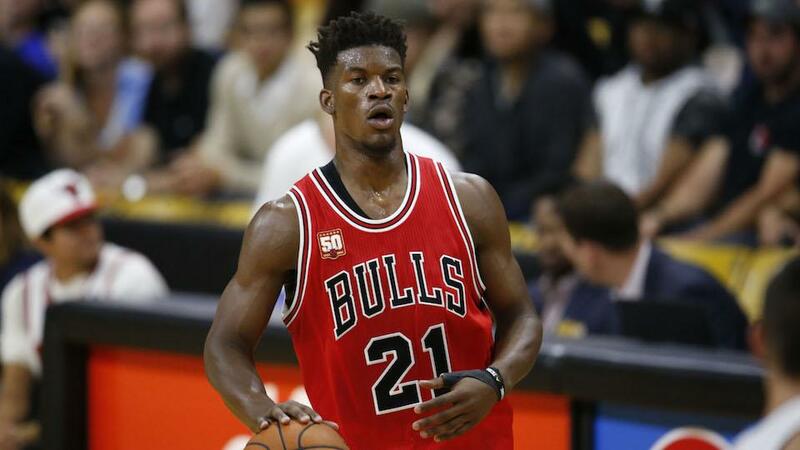 Against Milwaukee, Jimmy still facilitated the offense but kept the ball moving much more. Everyone was able to get involved, and the offense looked much better. Granted, Stan Van Gundy’s Pistons defend a lot better than the Bucks. Pau Gasol played pretty well for an old guy on a back-to-back. He scored 16 points to go along with eight rebounds and eight assists. Pau attempted four three pointers (making one), but his stroke is pretty sound from deep. Makes you wonder how things might’ve been different if the team made a conscious effort to have him out there more often from the start. Giannis Antetokounmpo was the player of the game. Now the Bucks point guard (at nearly seven feet tall! ), Giannis was absolutely unstoppable unless Jimmy Butler was on him. The Greek Freak tallied a career-high 34 points on 14/22 shooting to go along with nine assists. His only weakness offensively is shooting, so putting the ball in his hands forces teams to play him close or cede a long-legged drive to the bucket. That defensive attention has unleashed Chicago-product Jabari Parker, who many were starting to wonder about. Jabari had 24 and 11. After no-showing against Detroit, Nikola Mirotic played a big role on Sunday with 19 points and six rebounds. It seems pretty clear that Mirotic is most effective when given the freedom to go to work offensively. Sure, he’s gonna have some awful shooting nights, but forcing him to the margins of the offense just doesn’t fit his game. Hopefully Fred Hoiberg is able to find Niko’s sweet spot next season like he has for Doug McDermott this year. Justin Holiday continues to get regular rotation minutes, but still hasn’t broken through in a meaningful way. He’s 27, so it’s hard to imagine him developing much more in the future. Regardless, he’ll be cheap as hell next year, so *shrug*. E’Twaun Moore was solid in 27 minutes, and he’s been a real find this season. To a lesser degree, Cristiano Felicio was also a good spot, as he looks worthy of playing at the end of an NBA rotation. He doesn’t offer much offensively, but he’s a natural defensive center. Derrick Rose missed his second straight game but is set to return on Tuesday against Memphis. Khris Middleton sat out for Milwaukee, a nice break for the Bulls. Coming up: the Bulls head to Memphis on Tuesday night. The Bulls truly need every win they can get as they scrap for the final playoff spot in the Eastern Conference. They delivered a comfortable 118-102 victory against a Brooklyn Nets team lacking in talent. Let’s dive into the BULLets. 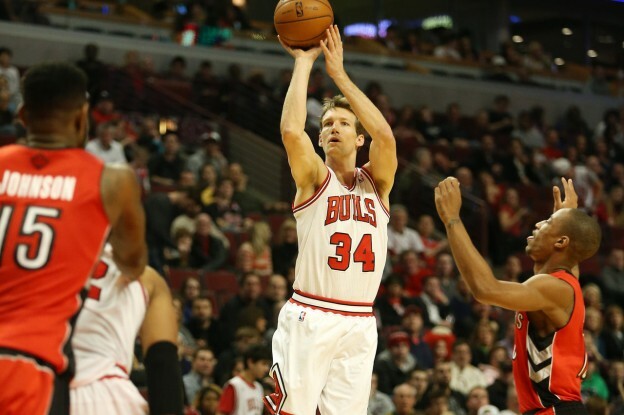 The Bulls went up huge early on, at one point doubling Brooklyn’s score with a 47-23 margin. They entered the half up 18, with great contributions coming from up and down the roster. Unfortunately, the Nets came out firing to make the game close again in the third quarter. Bojan Bogdanovic finished with a scorching 26 points and five assists after somehow dropping 44 on Philadelphia on Tuesday. Ultimately, the Bulls had built a big enough cushion to put the Nets away without too much anxiety. 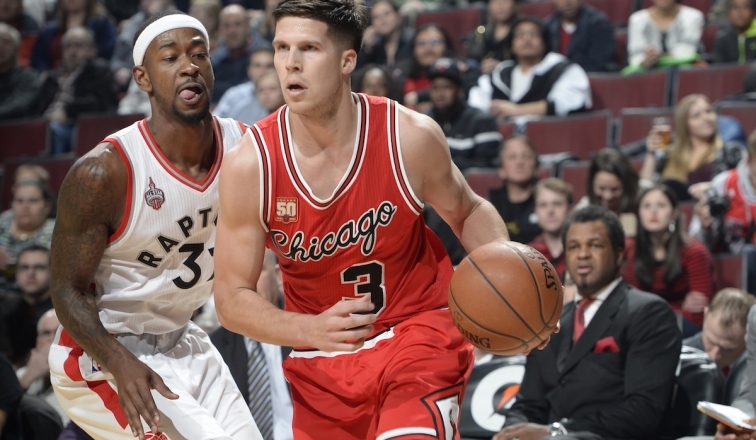 Doug McDermott continued shooting lights out, pouring in 25 points on 8/16 shooting and 5/8 from deep. Over his last five games, Doug is hitting 58.3% of his threes and averaging 17.6 points. He’s up to 42.9% from deep on the season, good for sixth in the NBA. McDermott has only shot below 40% on threes in one month this season, 37.3% in December. He is an elite shooter. Jimmy Butler appears to be almost all the way back from his knee issues, leading the team with 22 points and seven assists. He hit 7/12 field goals and all eight of his free throws in 32 minutes. Derrick Rose looked good too, adding 12 points, five assists, and three rebounds in 29 minutes. The injuries never stop. 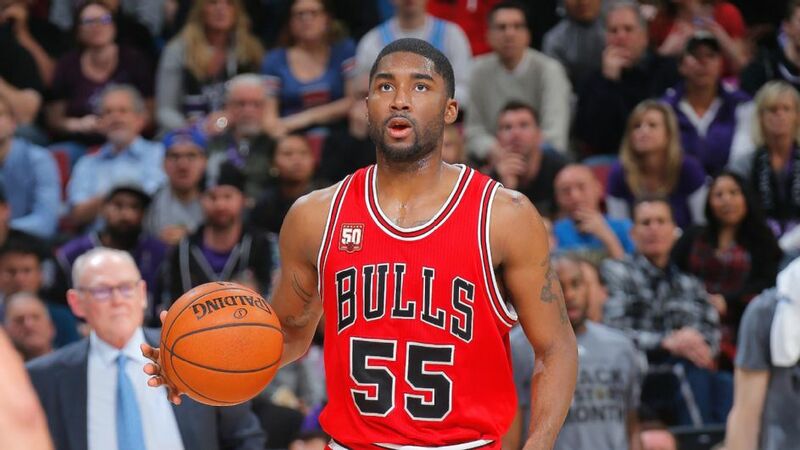 E’Twaun Moore played just two minutes after suffering a hamstring injury. On the bright side, Aaron Brooks added a crucial 12 points on 5/7 shots in just 16 minutes. A great performance, but the Bulls are much worse off if Brooks has to take Moore’s minutes for an extended period. While Justin Holliday hasn’t played particularly well, he’s shown enough that Tony Snell is completely out of the rotation. Over his last five games, Holliday is averaging 9.8 points on 46.7% shooting overall and 50% from three in 23.8 minutes per game. His career shooting numbers are putrid, so it would be quite the development for these results to stick. The Bulls will continue seeing what they have with the lanky wing. Brook Lopez is pretty clearly the best player on the Nets, but he was a complete no-show on Thursday night. He had nine points and just three rebounds in 31 minutes. To be fair, Lopez was +9, as Brooklyn’s YMCA-caliber bench got annihilated. I’m a big fan of Thaddeus Young. He’s had an interesting career; as a young player, he was expected to evolve into a ball-dominant star that he was never suited to be. After Doug Collins left Philly, Young finally started shooting threes, taking 3.7 a night his last year there as he seemingly transitioned into being a stretch four. However, this season Thaddeus has once again eschewed the three point shot, and it’s hard to blame him. He’s averaging 15.1 points this year and a career high 9.1 rebounds. His herky-jerky game is perfectly suited for confusing defenders inside the arc. There are a ton of ways to be a good NBA player, and Thaddeus has found his own. He had 16 points, 14 rebounds, two steals, and two blocks against the Bulls. Coming up: the Bulls host Utah on Saturday night.